Melting ice, a military arms race, the rush to exploit resources at any cost—the Arctic is now the stage on which our future will be decided. And as temperatures rise and the ice retreats, Vladimir Putin orders Russia’s oil rigs to move north. But one early September morning in 2013 thirty men and women from eighteen countries—the crew of Greenpeace’s Arctic Sunrise—decide to draw a line in the ice and protest the drilling in the Arctic. Thrown together by a common cause, they are determined to stop Putin and the oligarchs. But their protest is met with brutal force as Putin’s commandos seize the Arctic Sunrise. Held under armed guard by masked men, they are charged with piracy and face fifteen years in Russia’s nightmarish prison system. Ben Stewart—who spearheaded the campaign to release the Arctic 30—tells an astonishing tale of passion, courage, brutality, and survival. With wit, verve, and candor, he chronicles the extraordinary friendships the activists made with their often murderous cellmates, their battle to outwit the prison guards, and the struggle to stay true to the cause that brought them there. Kirkus says that Ben Stewart "conveys the passion and idealism of the activists... and the determination of Vladimir Putin to make an example of them." 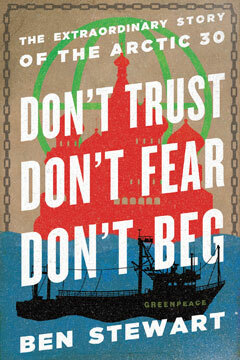 PW calls Don't Trust Don't Fear Don't Beg "a stirring narrative of protest and government oppression."